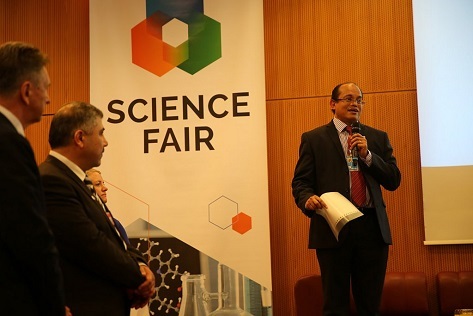 The Executive Secretary of the BRS officially invited the STAP to be involved in the inaugural BRS Science Fair, May 7-9, 2015, on the occasion of the Meetings of the Conferences of the Parties to the Basel, Rotterdam and Stockholm Conventions in Geneva, May 4-15, 2015. The STAP Chair and STAP Chemicals Panel member were asked to participate in the form of on-film interviews on such aspects as the complementarity of the work of the STAP with that of the subsidiary bodies of the Conventions, the ways in which the STAP contributes to scientific understanding for the Chemicals and waste focal area, and STAP views on embedding science in policy and decision-making. STAP was also requested to be a part of joint side events with the Stockholm POPs Review Committee, and was invited to share lessons learned from Stockholm Convention work that might be applied to supporting the Minamata Convention. In addition, the GEF Secretariat invited the STAP to take part in a high level Panel side event at the start of the Triple COP, as well as to participate as part of a GEF series of presentations and/or face to face exchanges with participants during the Science Fair, to permit the STAP Chemicals Panel member to present on emerging, cross-cutting issues such as Marine Plastic Pollution and solutions, and Soil and Chemicals, that might be further considered by Chemicals Conventions, and others such as the UNCCD, UNFCCC, CBD, and the corresponding focal areas and International Waters of the GEF, in particular. A particular success was the GEF Side Event, which included a High level Panel consisting of the GEF CEO, Naoko Ishii; GEF Programs Unit Lead, Gustavo Fonseca; Executive Secretary, BRS, Rolph Payet, STAP Chemicals Panel Member, Ricardo Barra; Environmental Director of Hewlett Packard, Herve Guilcher, and Professor, University of Dar Es Salaam, Tanzania, Katima Jamidu. The event was filled to capacity, and the STAP Panel member was able to provide a quick presentation to give scope to the problem of marine plastics, and to highlight the alternatives, business opportunities and need for enabling environments to support innovative alternatives to plastic and to manage the plastic that does exist. His information was complemented by the GEF Secretariat acknowledging STAP’s early flagging of the issue in 2011, and highlighting their commitment to developing interventions for the issue. The private sector representative informed the audience about their efforts in Africa, and the challenges of getting waste collected and returned to the company; but he also emphasized the need for government setting the appropriate regulatory environments, and banks and other financial mechanisms being set up to give financial incentive and other forms of support. Professor Katima pointed out the specific challenges in Africa to receiving plastic waste, through illegal and legal channels, the cultural value attributed to plastic and the purported “developed world” type of convenience attributed to its use, as well as the move away from indigenous traditions in bulk shopping, all of which contribute heavily to an uptick in plastic consumption and waste quantities. He called for specific analysis of the necessity of toxic additives to plastics and the need for further research overall. The audience participation was enthusiastic, and one of the needs raised by multiple delegates and supported by the panel, was the need for anthropological and sociological research to unravel the key to changing human behavior and cultural valuation of the incorporation of plastics into their lifestyles. The STAP also sees this as a critical pursuit for the Chemicals & Waste focal area overall, since lack of stakeholder will is proving to undo the best technological interventions in the waste management arena in particular. Another outcome was the recognition that global plastics pollution is actually a cross cutting issue that involves not only chemicals and waste, but may fit into different programs that the GEF is developing such as the integrated approaches (cities, food security, biodiversity, climate change etc. ).